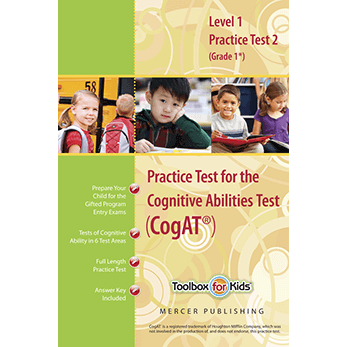 Mercer Publishing's CogAT practice tests are the #1 cognitive abilities test prep materials available for testing into your schools TAG (talented and gifted) or GATE program. Each practice test is designed with the same format and number of questions as the actual exam. Each practice test book contains 1 full-length exam at the 1st grade level and comes with answers and explanations. Downloadable versions of our practice tests are available to both MAC and PC users. For a more in-depth description of the CogAT exam, utilize our Frequently Asked Questions or Sample Questions pages to answer any questions you may still have. The Total Study Package is designed to give each student everything they will need to achieve their highest score on the exam, including 4 full-length practice tests in both form 6 and form 8 of the CogAT exam. The Form 8 Study Package includes 2 full-length Form 8 practice tests with a bubble sheet answer form and timer. The Form 6 Study Package includes 2 full-length Form 6 practice tests with a bubble sheet answer form and timer. The Essentials Study Package includes Test 1 from each form of the exam, a bubble sheet answer form and timer. The CogAT Level 7 Practice Test 1 is designed for 1st grade students. This test contains a full-length practice test, with the same number of sample questions and format as the actual CogAT Level 7 exam. The CogAT Level 7 Practice Test 2 is designed for 1st grade students. This test contains a full-length practice test, with the same number of sample questions and format as the actual CogAT Level 7 exam. The CogAT Level 7 Practice Tests 1 & 2 are two full-length practice tests, with the same number of sample questions and format as the actual CogAT Level 7 exam. 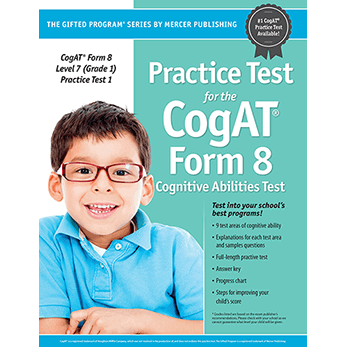 The CogAT Level 7 Practice Test 1 eBook is the downloadable version of the Form 8 Level 7 Practice Test 1. eBooks are downloadable on both PC and MAC products and are viewable for 60 days. eBooks are not printable. 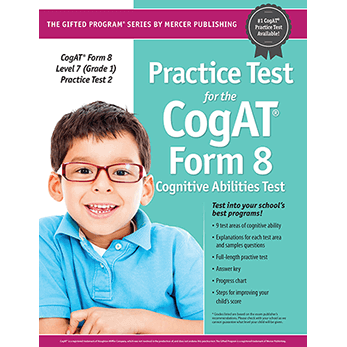 The CogAT Level 7 Practice Test 2 eBook is the downloadable version of the Form 8 Level 7 Practice Test 2. eBooks are downloadable on both PC and MAC products and are viewable for 60 days. eBooks are not printable. 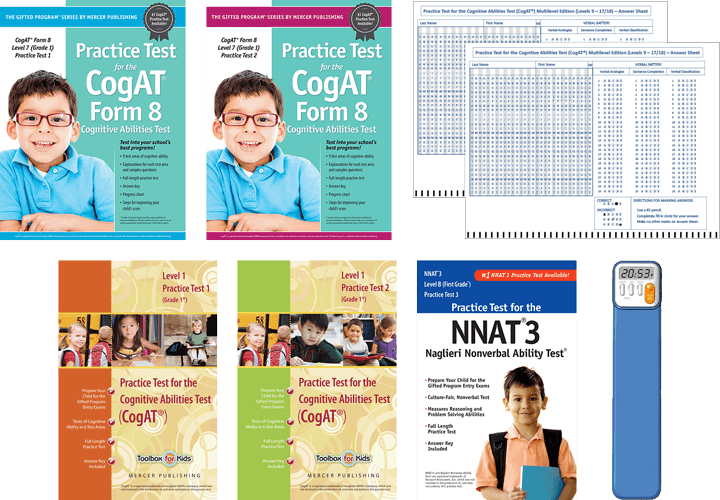 The CogAT Level 7 Practice Tests 1 & 2 eBook are the downloadable version of the Form 8 Level 7 Practice Test 1 & 2. eBooks are downloadable on both PC and MAC products and are viewable for 60 days. eBooks are not printable. 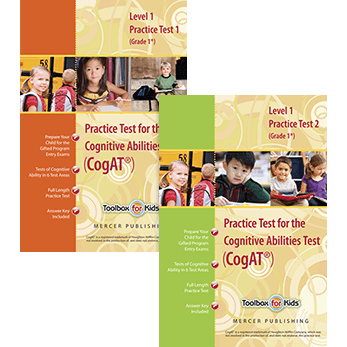 The CogAT Level 1 Practice Test 1 is designed for 1st grade students. This test contains a full-length practice test, with the same number of sample questions and format as the actual CogAT Level 1 exam. 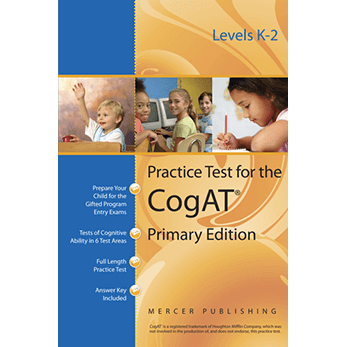 The CogAT Level 1 Practice Test 2 is designed for 1st grade students. This test contains a full-length practice test, with the same number of sample questions and format as the actual CogAT Level 1 exam. 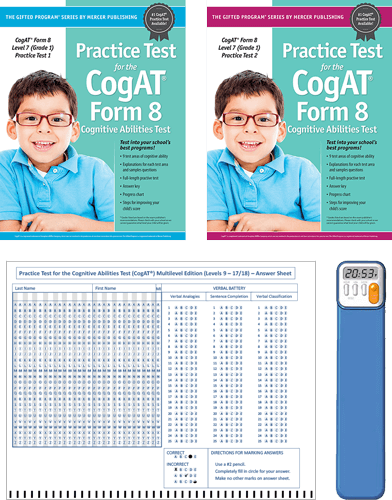 The CogAT Level 1 Practice Tests 1 & 2 are two full-length practice tests, with the same number of sample questions and format as the actual CogAT Level 1 exam. 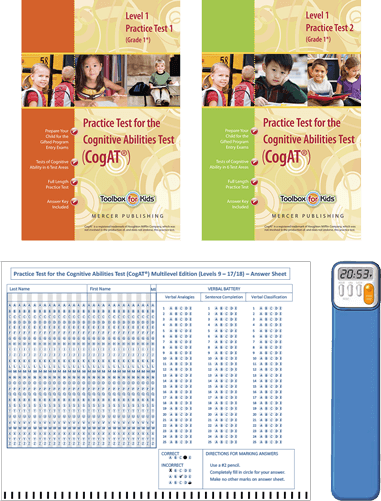 The CogAT Level 1 Practice Test 1 eBook is the downloadable version of the Form 6 Level 1 Practice Test 1. eBooks are downloadable on both PC and MAC products and are viewable for 60 days. eBooks are not printable. 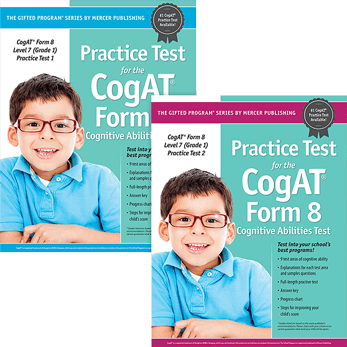 The CogAT Level 1 Practice Test 2 eBook is the downloadable version of the Form 6 Level 1 Practice Test 2. eBooks are downloadable on both PC and MAC products and are viewable for 60 days. eBooks are not printable. 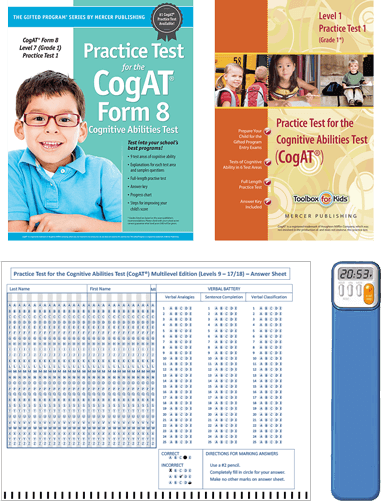 The CogAT Level 1 Practice Tests 1 & 2 eBook are the downloadable version of the Form 6 Level 1 Practice Test 1 & 2. eBooks are downloadable on both PC and MAC products and are viewable for 60 days. eBooks are not printable. The Primary Edition Practice Test is a full-length form 6 practice test in the primary version. Sample questions on this test span grade levels K-2 and allow additional practice for students. The Primary Edition Practice Test eBook is the downloadable version of the Primary Edition Practice Test. eBooks are downloadable on both PC and MAC products and are viewable for 60 days. eBooks are not printable. CogAT® is a registered trademark of Houghton Mifflin Company. 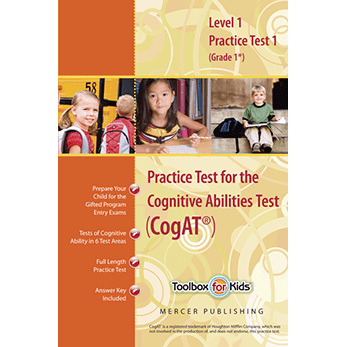 The Cognitive Abilities Test (CogAT®) is owned by Houghton Mifflin Company and published by Riverside Publishing, a Houghton Mifflin Company. Neither Houghton Mifflin Company nor Riverside Publishing was involved in the production of, nor endorses, these practice tests.